Item Number: 66-12-03 19488 Actual Weight: 2 lbs. Use in manufacturing, food processing, janitorial, hazmat splash protection, and laboratory applications. Special nitrile (NBR) compound is resistant to a broad range of solvents, animal fats, and other chemicals and provides excellent protection against abrasion, punctures, and snags. 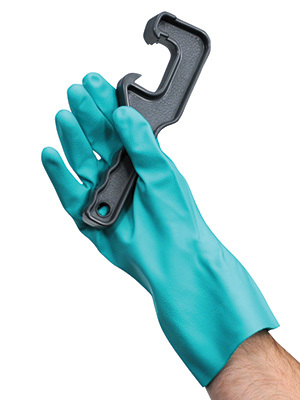 Gloves feature a case-hardened finish to make it easy to pull gloves on and off. Bisque finish grip makes wet work safer and easier.